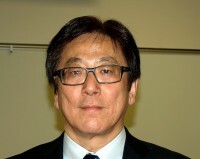 Professor Makoto Nakai, Ph.D., is currently at Salt Lake Community College as part of the school’s faculty exchange with Shitennoji University in Osaka, Japan. Until recently, Nakai resided there as acting professor of business management due to his extensive schooling in the field and thirty years of experience as an economist for a brokerage firm. Nakai was given a chance to convey his longtime experience to SLCC students and faculty, paired with a knowledge of Japan’s most recent economic events. He spoke Friday, Feb. 24 during a forum regarding Japan’s current economic and business circumstances. “The Japanese economy will not recover unless Japanese companies change their way of thinking,” said Nakai. Nakai discussed the world market and the domino-like effect on the island country’s economy. The consequences of Japan’s series of crippling natural disasters last year were also broached in part, but a large portion of the presentation placed emphasis on certain changes that need to be made within the structure of corporations, particularly if they want to continue competing in a world arena. In saying this, he noted that export is no longer the main drive of Japan. While Japan’s economy is the third largest in the world, just behind the United States and China, with emphasis on cars, electronic devices and computers, there has been a major decline. Nakai said that three risk factors play a part in this. The first is the sluggish production due to the halt of nuclear power plant operation because of 2011’s disasters. Second is the downswing of foreign economies due to global financial plant operation. The third is the depreciation of the yen as compared to the American dollar. This depreciation comparison relates to when global credit uncertainties occur or when they are placed in recessionary periods of turbulence. Additionally, when it comes to the United States’ cycle of currency, the Federal Reserve provides a relatively open policy until mid 2013. But the Bank of Japan is very hesitant to ease up on their own policy. The economic bull market of Japan’s “Bubble” during the 1980s led to the unfortunate “Lost Decade” of the 1990s, where economic growth was only at 1.5%, slower than that of other major developed countries. Former Prime Minister Junichiro Koizumi made vows to fix this decline when he took office as Prime Minister in 2001, but was ultimately unsuccessful. “The Koizumi reforms made differential problems between rich people and poor people,” said Nakai. Which leads us to where we are now. Just as much as the environment and the world market have influenced Japan in its economic ebb and flow, so too has interior corporate corruption or indiscretion thrown ripples on the pond. Two such examples are Olympus, the company which makes Olympus cameras, and the Daia Paper corporation. In the case of the former, this is a strong example of situations where heads of companies are only figureheads while chairman, with an emphasis on traditional Japanese values and upbringing, hold all the power. Michael Woodford acted as the Olympus president for only six months before chairman Tsuyoshi Kikukawa and the rest of the board ousted him for neglecting to follow Japanese cultural practices. In the latter case an example is shown where heads of companies act as complete heads. A kind of culture characterized by, “absolute obedience to relatives of the founder, who have served as executives.” Mr. Mototaka Ikawa was arrested recently on counts of embezzling from the company and its subsidiaries in order to distribute the funds in his own account as well as to companies overseas with regards to gambling. So while the economy of Japan is expected to expand gradually over time, “supported by reconstruction demand related to the Great East Japan Earthquake,” there are some impediments. Sluggish production due to circumstance, the downswing of foreign economies and the slow decline in worth regarding the yen being some. But corporate Japan itself plays the largest part, trapped as it is in ideals based on total control by authorities with an unwillingness to change in order to fit into the world market it belongs in.